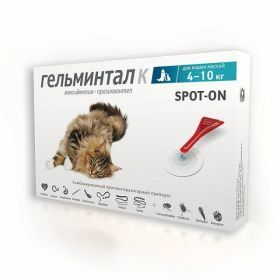 Gelemental prescribed For cats with medical and preventive purpose in case of intestinal nematodosis (toxocariasis, toxascaris, uncinaria, hookworm), cestodosis (teniidoze, depilation, ehinokokkoz), Enomoto caused by fleas, otodectes and notoedres, as well as for the prevention of dirofilariasis. The drug is used by cats drip ("spot-on") application to dry intact skin. Before use in pipettes break off the upper part, the drug is applied to the animal's skin in places inaccessible for licking – in the neck area at the base of the skull, in the treatment of large animals, the contents of pipettes are applied to the skin in 3-4 points. For more details, see the instructions for use.